Wow Cassandra! You knocked my socks off with this one! Absolutely stunning. I hope you enter it in the Blogger’s Quilt Festival in May. They usually have a rainbow or a mini category. I know I have said it before but you are so talented and inspiring! Thanks for sharing this beauty with Oh Scrap! Holy WOW! Amazingly wonderful! First rainbow quilt? I’d say you nailed it! The fabric, the colors, the quilting – perfection!! And the back!! Congrats on a very successful experiment and the seriously awesome little quilt it produced!! Wow! Awesome quilt design! I love the rainbow colors and your quilting is perfect. Well done! That is just amazing! 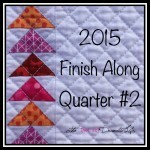 I love the rainbow colors and the shape, but the quilting is what really makes it wonderful! 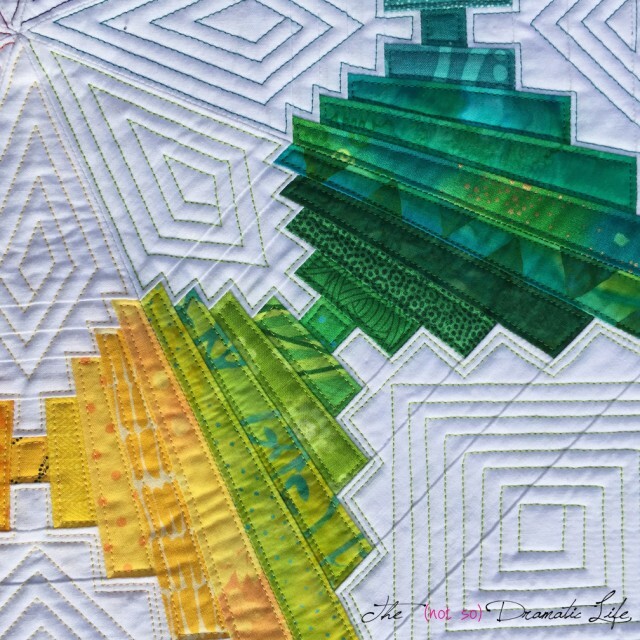 What a fabulous effect, and I think the touch that really sets off the quilt is the different quilted thread colors you used. 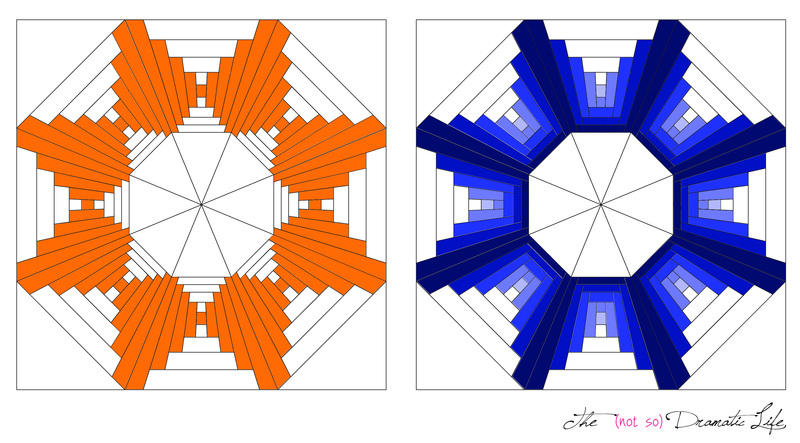 Your variations in color placement are really interesting – I think you could make a very cool snowflake or icy pattern with blues like you have shown. What program do you like to use for creating your paper piecing patterns (if you don’t mind me asking)? 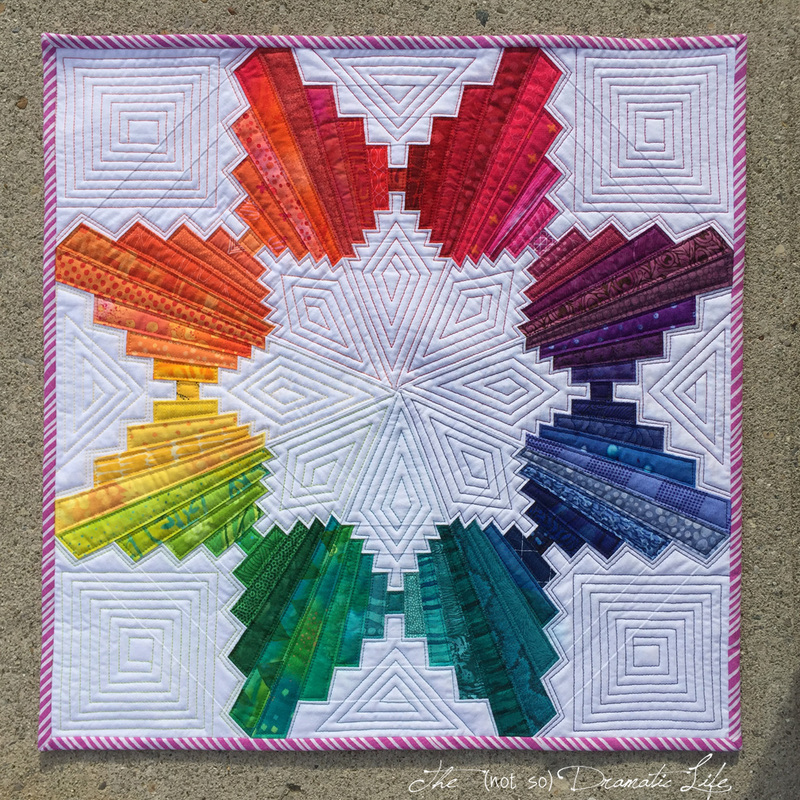 I think this color wheel variation is absolutely stunning, and is probably my favorite of your mini series so far this year. Beautiful! This is a truly stunning design and quilt. 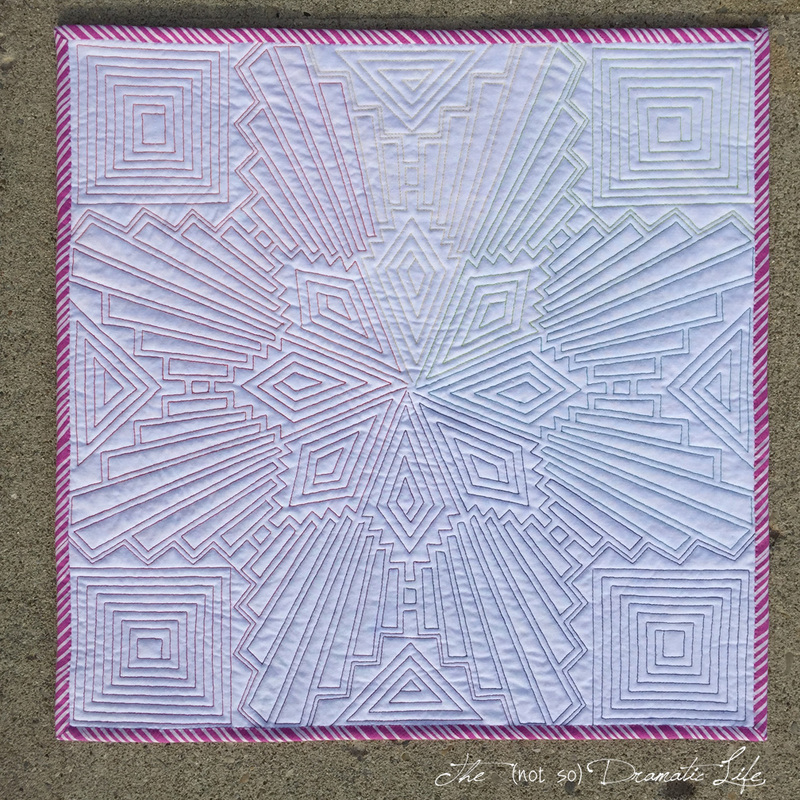 I always try to work out how a quilt design was achieved but your quilts defeat me and which is why I love the show and tell bit of your blog! Mindyou I’ve no idea how you get the precision of your quilting…. Are you making this pattern for sale? If so, where can I purchase it? Stunning! Wow! This is absolutely stunning. Your fabrics blend so well together and form an amazing rainbow. I bet you could write it up as a pattern and it would sell very well. Magnificent! It does have an Art Deco feel. I like it better than feathered stars. So many possibilities! Thanks for shating the piecing diagram. Wow! One of my favorite rainbow mini’s I’ve seen in a long time! Gorgeous and would love to make one myself! Everything about it is stunning…fabric colors and quilting! Fantastic job! Wow. This is beautiful. So clever to alter that Courthouse Steps block. And the quilting is cool too with all those colors. Very impressive! Wow, gorgeous! I like the other layout, too, but the quilting on this one is just amazing. I found this on Oh Scrap! Outstanding piece of work! Truly inspirational and beautiful. Thank you for sharing your work with us on #scraptastictuesday! Such a clever interpretation of a traditional block which is beautifully enhanced by your stunning quilting. Great job! This is an amazing idea that’s work so so well! Here from Bonnie Hunter’s facebook post; wow, this is beautiful. Thank you for sharing how you made it! The forced perspective gives it such an intriguing look, and the colors and quilting are so lively! Love how there’s a kind of feathered star in the center. Wow!! That is a FABULOUS quilt. Thanks for sharing the how to!! Pattern – I want this pattern! Would you consider printing full-size paper piecing templates? this was fabolous, both workmanship and color choices! This is amazing! The amount of work that went into designing it and then making it must have taken you hours and hours! Wow! And tiny too! Well done. Hope your entering it in shows. What a fun take on Courthouse Steps, and the quilting is fantastic. I am so impressed and inspired by every aspect of this quilt! thank you for sharing. Oh my – I am awestruck Cassandra! This is such an awesome quilt! You are very talented! Will you be writing and selling a pattern? Because i would buy it in a heartbeat! I hope you enter this quilt in a show! This is fantastic! I love the art deco feel. This is Amazing! I love the fabrics the quilting, all of it! Love this would like to have pattern when available. Holy smokes! I can’t believe you have that many pieces in a mini! You are devoted! The quilting is just as amazing as the pattern. Well done indeed! First time visit for me and wow….what an amazing piece to see. Its beautiful. This is exquisite! It’s hard to believe the quilt is only a little over 18 inches square. Thanks for sharing your process of arriving at the final design/coloration. Okay, Cassandra. Enough. You have raised the bar on ‘drop dead gorgeous’. Nice work breaking out of your old hexagon mold, though it was fabulous, too. Cassandra, I have made ten or eleven color wheels over the years (and looked at many others) and yours has “knocked my socks off”. I am very tempted to try to collect 72 fabrics and emulate your gorgeous wheel. Since you published your layout on your website, is it okay with you if I copy your pattern for personal use and then spend my days (weeks, months) trying to create my version of your beautiful wheel? If I am successful my version of your wheel would hang on the wall of my sewing room and not go on public display at a quilt show because it would be a copy, not an original. Wow!! This is simply stunning. I love the geometric look – kind of made me think Art Deco. Love this, it is so precise and so free. Amazing quilting too! This is so amazing! I love the design and the quilting. That is absolutely gorgeous!! I love everything about it, from the design to the colours to the quilting. The pattern would be a lot of fun to try out in different colours and with different shading, like you shared in the samples. The possibilities are practically endless! Looks fab! Thank you for sharing! WOW! What else can I say? Stunning. What a fabulous quilt. 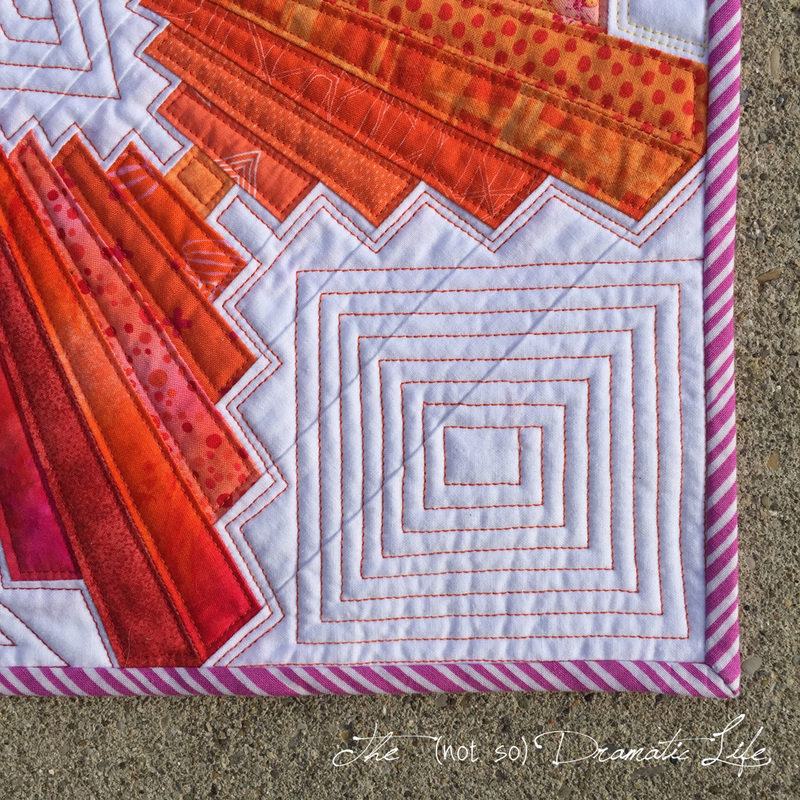 I love the colors, pattern you invented and the way you quilted it is perfect. You are truly a talented artist. This is my first time visiting your blog and it won’t be my last. 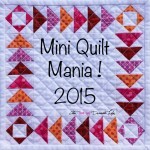 I’m visiting from Janeen’s QAD Friday Paper-piecing Party as I wanted to say how much I enjoy looking at your fabulous mini quilt. If you ever publish your pattern I would want to buy one although I don’t think I have anywhere near 72 shades of fabric. LOVELY! I’m glad I found your blog. This is gorgeous!! Fantastic job! This is incredible! Would you consider selling the pattern? Amazing!! Spectaculair!!!! I love this. Hi Cassandra, I fell in love with your quilt. Is it ok with you if I try to copy your pattern? I would really like to try my hand at it.. Please let me know? Unless you’re planning on selling it, in which case I would buy it right away! Thank you for inspiring us…. This is a beautiful quilt. I’m in awe of your design abilities. When you are ready to sell the pattern, let me know!!! Visiting from Cindy’s Oh Scrap! and I agree with the general consensus of WOW! and ‘you knocked it out of the park’ on this one! Just fabulous and the quilting is fantastic too. Those wedges must be PRETTY teensy if the quilt is only 18.5″ square!!! This is just superb!!! Please let me know if this pattern is available for sale. Excellent work all around. 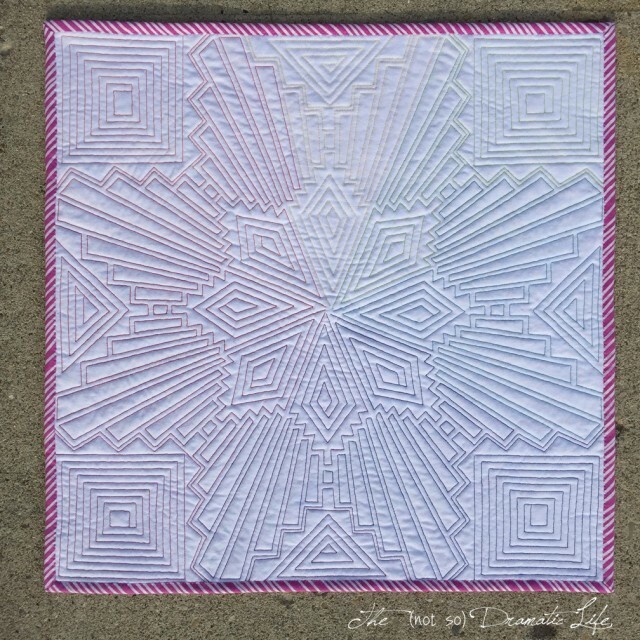 This is a beautiful design, as is the quilt. You had a lot of beautiful finishes for Q2! I’m helping Adrianne with the FAL and I’m to also say that I am visiting as part of the FAL Cheerleading Team. Great work! Love that it’s just a wild log cabin. 😉 Smart! Are you selling this pattern? I’d love to make this.